JANUARY 10, 2008, NEW DELHI Coke is produced by the heating of coking coal in a coke oven in the absence of air. The process is called carbonisation. A coke oven battery may consist of 50-80 coke ovens arranged side by side each 400-500mm wide, 4-7 metres high and up to 15 metres long. Crushed, mostly blended coal (approximately 80% less than 3mm) is charged into the coke oven and heated until the centre of the charge has reached a temperature of 1100°C. This can take from 14 to 24 hours depending on the operation of the battery. The by products from the coke oven consist of coke oven gas (some of which is used to provide heat for the carbonisation process), tars, oils and other chemicals. After completion of the carbonisation, the incandescent coke is pushed from the oven and quenched with water or inert gas. The latter, commonly called dry quenching, is becoming more common because of energy savings which can be made by heat recovery. Modern coke making practice involves the carbonisation of a blend of coking coals which together have the properties required to make a coke suitable for the blast furnace. The leaders in blend technology are the Japanese, whose blend consists of up to 20 different coals ranging in quality from coals with very high coking properties to coals with almost zero coking properties. The following table lists some of those coal properties which a coke maker considers important. Too high moisture creates difficulties in handling. Also lowers amount of carbon available. High ash reduces efficiency in blast furnace. Some of the sulphur in coal reports to hot metal and has delaterious effects on steel quality. Makes basic carbon steel brittle. Depends to some extent on other blend components. Depends on other blend components. Better quality coals exceed 1000 ddpm. High alkalis in ash cause high coke reactivity. Mean max. Reflectance of Japanese blends about 1.1-1.2%. The reduction of iron ore to iron takes place in the blast furnace. Iron ore (or sinter), blast furnace coke, scrap and flux are charged into the top of the furnace and molten iron (called hot metal) and molten slag are tapped from the bottom of the furnace. Hot air is blasted into the lower part of the furnace and blast furnace gas which has low calorific value is recovered from the top. The reduction process is carried out primarily by carbon monoxide and a maximum temperature in the furnace of 1650°C is achieved. Additional fuel is injected into the furnace with the blast air and helps to maintain furnace stability. This can take the form of heavy fuel oil or tar (if oil prices are low), or pulverised coal. Pulverised coal injection (PCI) replaces coke during blast furnace operation and therefore allows the replacement of coking coal by steaming coal. PCI levels are normally about 80-100 kg/tonne of hot metal but injection rates of over 200 kg/tonne have been successful. An injection rate of 100 kg/tonne will replace approximately 119 kg of coking coal or 85 kg of coke. At high injection rates, many of the qualities of a PCI coal are similar to those for coking coal, namely low sulphur, phosphorous and alkalis. Ash should also be low and under 8% is preferred, although up to 12% is used. Hardgrove Index is a function of the capacity of the coal grinding and handling plant, generally in the 45 to 75 range. Most PCI systems mill the coal to reach 75% passing a 75 micron sieve. The coal selected is usually reactive with volatile content between 25 and 35%. 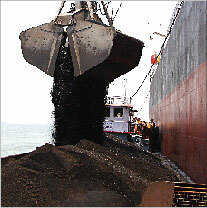 Other steel makers use a different practice in which the coal is crushed to 95% passing a 2mm sieve (this type of system is known as granular coal injection - GCI). 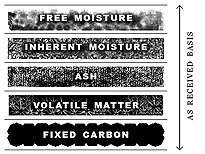 GCI are generally low volatile coals or semi-anthracites in the 12 to 22% range although higher volatile coals can be employed.